Limited edition of 1200 copies. Track listing: 1. Opening (03:24) 2. Erich Von Zipper (01:39) 3. Parachute Jump (03:06) 4. Stop House Band (03:39) 5. Beach Walk (01:14) 6. Frankie's Parachute Jump (02:55) 7. Von Zipper Bit (02:46) 8. Bonehead Hears The Music (04:55) 9. The Big Chase (04:55) 10. Bonehead's New Love (01:28) BACKING TRACKS: 11. 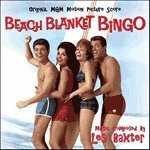 Beach Blanket Bingo (02:07) 12. Fly Boy (02:00) 13. I Think, You Think (02:07) 14. I'll Never Change Him (02:21) 15. It Only Hurts When I Cry (02:16) 16. New Love (02:06) 17. I Am My Ideal (01:34) 18. These Are The Good Times (02:22). Total Duration: 00:46:54.